The Chinese New Year holiday in Taipei is going to be fairly exciting this year! 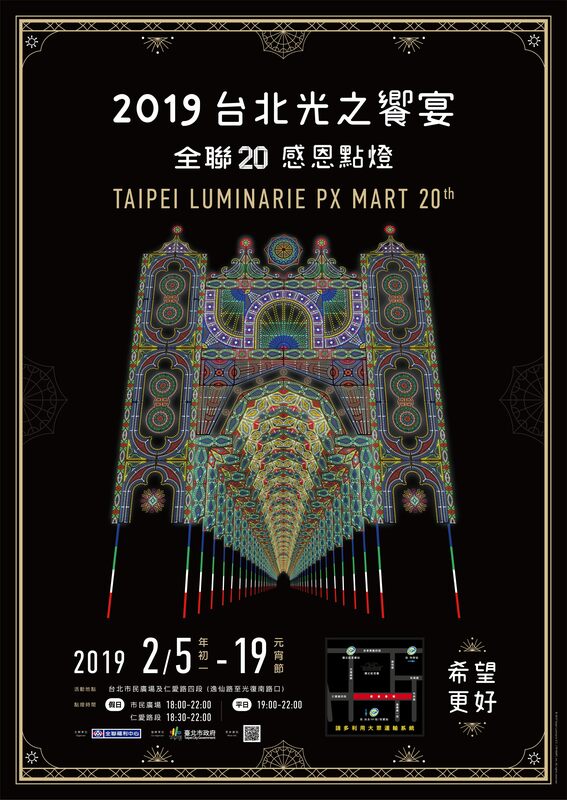 In addition to the Chinese New Year Street Bazaar and Taipei Lantern Festival, Taipei City Government will join hands with PX Mart in organizing the 2019 Taipei Luminarie Show. 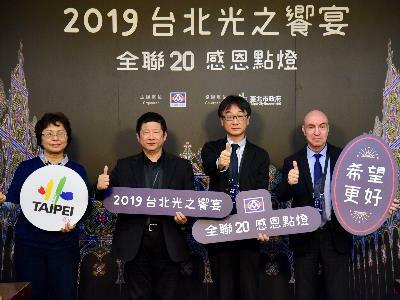 For the event, the organizers will recreate the Luminarie spectacle which attracted numerous New Year revelers in Europe, US, Japan, and South Korea. 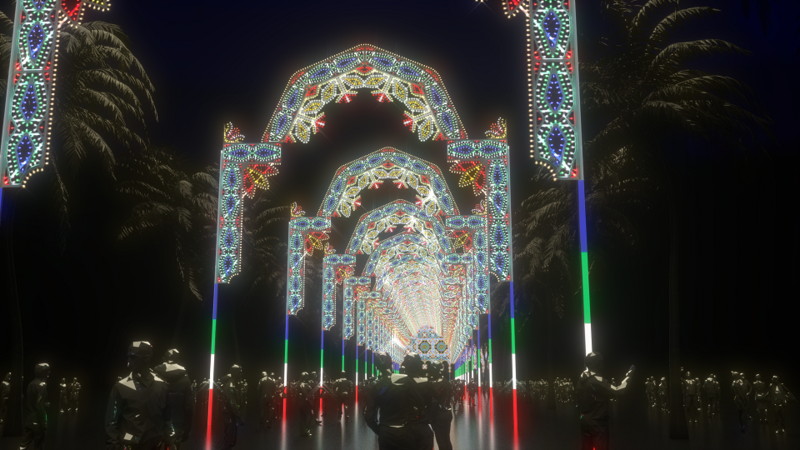 The corridor of extravagant illumination extending roughly 300 meters will be installed along Renai Road Section 4 and at Citizen’s Plaza to provide Chinese New Year in Taipei a different ambience. Commissioner of Economic Development Lin Chung-chieh remarked that more and more people have decided to spend their CNY holiday in northern Taiwan. For this year, city hall will be organizing a series of related activities, and he invited the public to stop by the Chinese New Year Street Bazaar to purchase goods they will need for the long holiday and to enjoy a warm and welcoming Year of the Pig. During the holiday, he welcomes everyone to drop by the Citizen’s Plaza to enjoy the mesmerizing showcase. Furthermore, by connecting with the Taipei Lantern Festival taking place in the western part of town, the entire city will light up the night sky in the month of February. Visiting the light show is also a great way for couples to celebrate the upcoming Valentine’s Day! From the commercial districts in the west part of the city to the busy department stores in the east part of town, the festivities is bound to bring excitement and joy to the public during the CNY holiday while promoting local tourism. 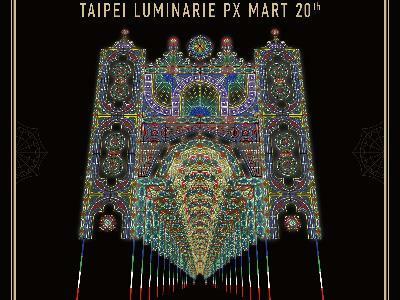 According to the event co-organizer PX Mart, Luminarie has its origins in Italy. The project involves sizable wooden structures decorated with light bulbs of different colors, forming an illumination art piece presented in a 3-dimensional format. The exhibition became a major event for Osaka as a memorial of the Grand Hanshin Earthquake in 1996. The commemorative event has been held for 24 consecutive years and attracted between three to five million visitors each year. 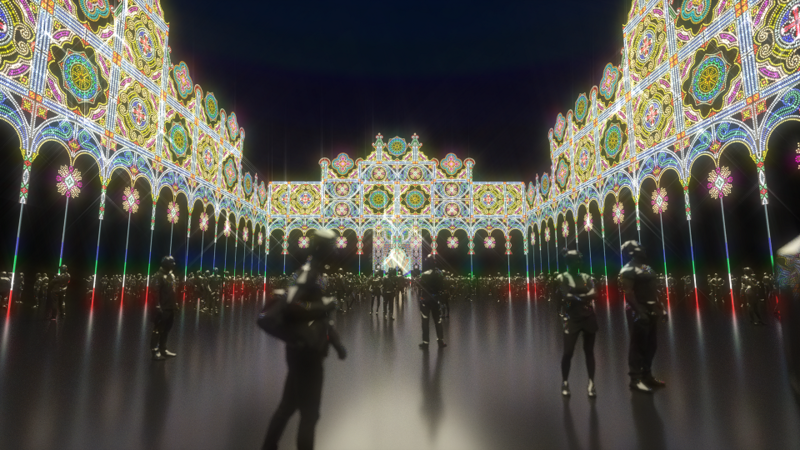 The 2019 Taipei Luminarie comprises three distinct sections: Galleria, Façade, and Spalliera. The entire work consists of 233,990 LED light bulbs deployed across a corridor area measuring approximately 300 meters in length and 20 meters in height. The grand and splendid feast of light seeks to emit an essence of “hope” and “brighter future” for the New Year, as well as boosting the international profile of Taipei with the international art showcase. The official kick-off and lighting ceremony will take place at 6 pm on February 5. The structures and display will be activated daily during the showcase from February 5 through 19, from 6:30 PM through 10 PM on weekends and holidays (7 PM – 10 PM on work days). There will also be a flea market with numerous stalls, as well as a public art piece #beTaipei at the venue for those interested in taking selfies. For more information, please visit the Facebook fan page of the Department of Economic Development (http://www.facebook.com/tcooc).